Have You Learned This Lesson Yet? “I’m a terrible mom!” Do you ever say these words? And I did that day… the day years ago when I was working in my office, minding my own business, when out of now where my son threw a paper airplane at the back of my head… on purpose. Not one to normally welcome an air attack, I gritted my teeth, gave him the stern “mom voice,” and asked him to stop messing around. I told him I needed some private time so I could get some work done. He agreed, and turned to leave. Then he jumped around and threw the paper airplane at me again! As I unfolded the orange, construction paper airplane, I saw this message written in pink marker: “Mom, I Love You.” A few X’s and O’s followed his affectionate plane declaration. You know: hug, hug, kiss, kiss. Pure precious. Nice! I said to myself. Loser-mom strikes again. I had scolded my son and reacted out of frustration with a harsh tone. All the while, my son was trying to tell me that he loves me. Time stood still as a self-condemning, toxic internal dialog began. Shame began to fill my heart, but as it did the Spirit of God within me gently nudged – reminding me that condemnation is not from Him. His conviction, however, spurred me on toward choosing a more godly response. I whispered a quick prayer. And as I moved in the way of grace the Lord changed the tone of my heart. God’s love trumped my anger. I called Preston back into my office and apologized for my behavior. I invited my tall, lanky pre-teen to sit on my lap and started a new conversation in a calmer tone. Honey, while I’m not particularly fond of airplane attacks, especially while I’m working, I AM fond of love attacks. We shared a sweet moment. And as we reconciled, this truth rose in my heart: when we allow God’s love to trump our anger, we position ourselves to experience restoration in relationships. The Bible tells us that we are to be slow to anger. It’s a lesson that I am still learning. Now, that doesn’t mean we should never be angry. Jesus exhibited righteous anger in the Jerusalem temple when he drove out the merchants that were buying and selling there. Righteous anger is biblically permissible. We should be angry about sin and injustice. But when we respond to others in anger, it becomes our sin. Got any relationships that are in need of restoration? Is there any anger, unforgiveness, or bitterness in your heart that might be gaining a stronghold in your life and keeping you from God’s best? Are you quick to listen or quick to speak? The benefits of allowing the love of God to trump any anger in my heart is tremendous, but the application sure can be challenging. I can’t overcome my natural, sinful tendencies to react, and overreact, in anger alone. I need God’s help. You do too. His grace meet us at our needs when we call on Him, and the Holy Spirit will help us to respond in God’s perfect love - not our own. I want to be quick to listen to the whispers of God’s love. Join me in asking God for His love to lead us today. Holy Father, You are perfect in love… and I am not. I confess my anger / bitterness / unforgiveness right now when it comes to _______________ (fill in the blank). Please forgive me and bring restoration to the relationships that have been affected by my anger. Help me recognize when I over-react or when I respond in anger that is ungodly. Give me the grace to respond in love, to be slow to speak, and quick to listen. READ Ephesians 4:26-31. Make a list of what the Bible says we should and should not do. Then use that list to guide you in prayer. Do you need to trade anger for love? Spend a few moments in prayer. 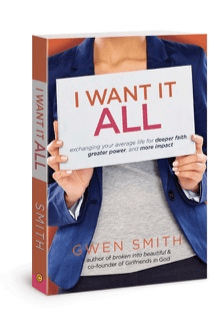 Gwen Smith’s book, I Want It ALL, is filled with practical help, Biblical depth, and applicable lessons. And it includes a Bible Study Guide right in the back. No extra purchases required! READY TO PEEK INSIDE THE PAGES? Download a FREE sample chapter at iwantitallbook.com. Or order yours today from Amazon, or your favorite retailer. For a signed copy, click here to order yours from our web store. Get a FREE downloadable copy of the I WANT IT ALL 7 Day Devotional Ebook here.